If I have a very large Popup Menu list how can I make that searchable? Imagine that you have a PopupMenu's list that requires a lot of scrolling through the selections. Is there a way to create a control that will only display a subsection of the complete list? I have finished a project where widgets like this have been useful so I thought I would share. 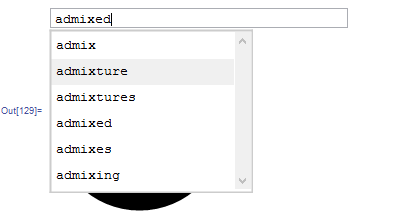 By combining InputField and PopupMenu a searchable popup selection table can be created. To address @kuba's comment by way of example in the GIF we have a toy interface. Normally you would not want your interface elements moving around all over the place. Therefore using popup menu is a good way to achieve this search menu objective. And Experimental`Autocompletebut this can be replaced with Mike's approach. Need to work on style, automatic scrolling and some edge cases, but already works quite well. Feedback appreciated. Not the answer you're looking for? Browse other questions tagged front-end gui-construction or ask your own question. How to make a dynamic nested menu? How to create my own inline drop down autocompletion in a text cell? How to create a notebook element that can replace itself? How can one popup menu be used to add another? How can I create a table of sliders? Manipulate Slider over discrete collection. Keyboard control. Can I evaluated a cell in a notebook in a background process?